It was long thought that language was a uniquely human trait — a dividing line that separates humans from other primates. But does it? We talk with one researcher who is studying how chimps talk. Speaking with Sally Boysen, a psychologist at Ohio State University. Dr. Boysen worked with chimpanzees for nearly 30 years. In the 1970s, she taught chimps to communicate, first using American Sign Language and later using graphic symbols. Her latest project was conceived late one night, seven years ago. Sally Boysen: And I happened to be in my office and I heard the chimps vocalizing someone was giving them dinner. And I said out loud, for some reason, oh, they must be having grapes. Followed by a reply to myself, oh, now how did I know that? So I went into the area where they were being fed, and they were having grapes! So the thought immediately came to mind, oh my goodness, if I can make that kind of discrimination based somehow on the acoustic features of those barks, can the chimpanzees do it? And more importantly, do they do it? Boysen began to study the calls chimps make in response to food. With a jumbo-size computer touch screen and some audio equipment, she recorded different vocalizations and asked chimps to match them to food items. The chimps did well at choosing the food that corresponded to the call. Boysen thinks scientists have been so focused on teaching chimps to communicate with non-chimp languages they’ve overlooked natural chimp calls. Like her hero, Jane Goodall, Sally Boysen is a pioneer among the small group of scientists working on non-human primate brains to understand the evolution of the human mind. After a stint working as a research associate with an American Sign Language project and then with a graphic symbol project, she began to teach her own group of chimps to understand Arabic numerals. Nearly fifteen years after she started, her chimps understand simple arithmetic, a feat no one thought she would accomplish. Although chimps and other great apes lack the neural controls and vocal cord structure needed to produce spoken language like humans, the part of their brain that controls communication is very similar to humans. Chimps at the Georgia State Language Research Center have been shown to understand spoken English at least as well as a 2.5-year-old child. Chimpanzees are humans’ closest relatives. We have DNA that is 98.4% identical, and the 1.6% difference may be an overestimate, since it includes non-coding regions of DNA. This means that if the human genome consists of 60,000 to 100,000 genes, less than 1600 genes account for the difference between species. Scientists believe that the chimpanzee (Genus Pan) and human (Genus Homo) lineages split about 4-5 million years ago. Boysen got the idea for her work with scale models from some of the child cognitive development literature. She tried to replicate the work by hiding an item in a miniature version of the chimp experiment room, and then asking the chimp to go find the item in the real room. She found a striking difference in performance between male and female chimps. Even female chimps with no training in cognitive experiments did better than the male chimps Boysen has worked with for decades. Boysen suspected it had something to do with the male’s attention span, so she trained them to pay special attention to the hiding event. Boysen has been working on the natural vocalizations of chimps for close to seven years. 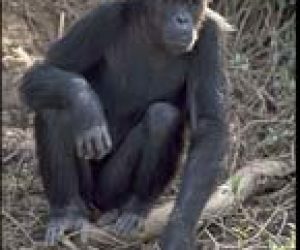 She has been a part of many different communication studies, but she is convinced that studying the natural communication system of chimps will shed light on the emergence of language in humans. And what’s exciting to me about that is, to me, it says that the neural architecture that supported the potential and possibility for human speech is very very old. And components of it are shared with the chimpanzee, who of course diverged off and then had its own parallel evolution. But to me it shows some precursor kinds of mechanisms in chimps that are alive today. For the last thirty years or so we’ve been so busy trying to teach them artificial languages, sign language, graphic symbols, et cetera, et cetera, and I was part of all of that, that we kind of forgot and totally overlooked the natural vocal repertoire of all the great apes. So it’s a completely unstudied area there are just a handful of studies that were done. It really feels like a discovery, a scientific discovery to me. Big deal that you teach a chimp to count, but it is a big deal to uncover, I think, a possible lead to us understanding and redirecting questions about the emergence of human speech. There’s just no question that’s critical to explore.